Facebook made like it's 1994 when it introduced stickers (read: emoticons) in Messenger chats, and now it's making like 1995 by expanding their role on the site. 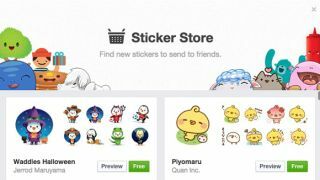 Facebook users can now add stickers to comments, which is bad news for any who'd rather just communicate with words. Facebook's available stickers are invariably adorable and generally range from cute animals doing cute things to other cute animals doing even cuter things. There are licensed stickers from shows like Adventure Time and Power Rangers as well. From the sticker menu, you can browse available sticker packs, all of which are free - for now at least. We've asked Facebook whether it has any plans to begin charging for sticker packs, and we'll update here if we hear back. It would be surprising if the answer is anything other than "yes," unless that answer is "no comment," which seems more likely. The continued popularity of emoticons on the web, in texts and basically anywhere else where they're available proves that if they are available, people will use them. Thankfully you can currently only post stickers in comments on existing posts, and not in new posts or statuses. Just recall that there was once a time when Facebook was considered the more professional and mature option compared with Myspace and other competitors. What is it turning into now?